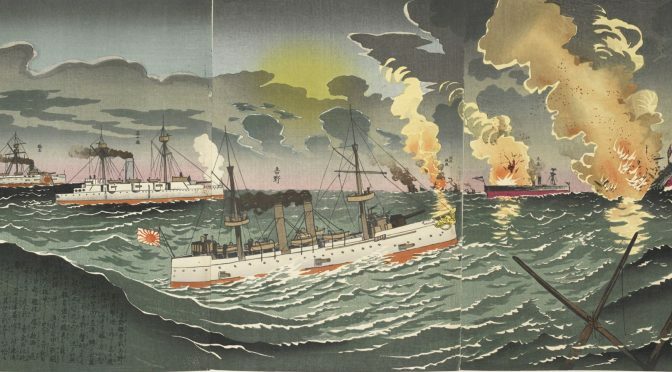 When war broke out between Japan and China in 1894, few expected a Japanese victory. Qing China had undergone its period of self-strengthening and modernization for much longer than the Japanese Meiji modernization period, had invested more money in its naval programs and platforms, and the Japanese Navy was supposedly outmatched both qualitatively and quantitatively. 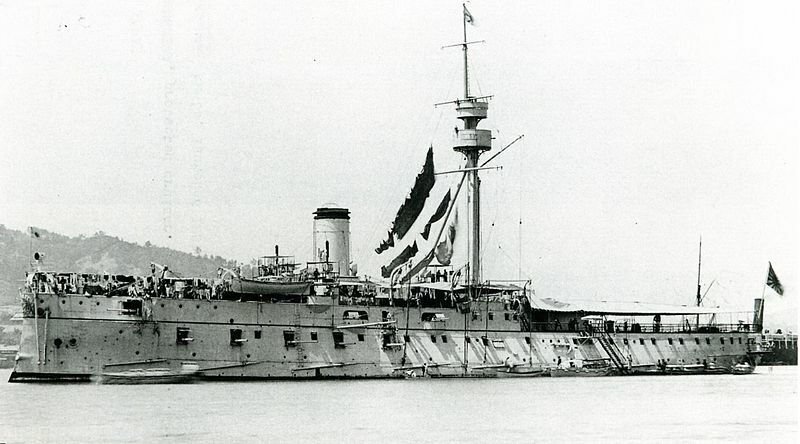 However, at the Battle off the Yalu River the Japanese defeated the Qing Northern Fleet in a decisive battle. So what went wrong in Qing self-strengthening? What left the Chinese so vastly unprepared for naval conflict? Upon a close review of both primary and secondary sources, three key answers emerge. Firstly, the lack of a unified Chinese Navy under the Qing Empire proved fatal in the First Sino-Japanese War. Second, corruption and inefficiency in the institutions of the self-strengthening movement ensured poor commanders and a lack of equipment in the Beiyang Fleet. Finally, Japan’s unified command, professional officer corps, rigorous training, and use of French Jeune Ecole tactics won the day. Li Hongzhang, the Chinese scholar, diplomat, and military leader, remains a critical figure in understanding the self-strengthening movement in China. He led modernization efforts across the Qing Empire, setting an example through his own Huai Army and the Beiyang (Northern) Fleet. Regional armies and fleets like the Huai and Beiyang soon became the model on which the Qing Empire built its new armed forces in the wake of the Taiping Rebellion. This practice would prove to have fatal consequences during both the Sino-French and Sino-Japanese Wars as factional politics would override any sense of national duty in the Northern and Southern Qing Fleets. Factionalism went beyond simply Northern versus Southern Fleet rivalries, as it even existed within the fleets themselves. Regional factions seem to have particularly irked Ding Ruchang, Li Hongzhang’s commander-in-chief of the Beiyang Fleet, where “there were many officers from Fukien in the navy, Ting Ju-ch’an (Ding Ruchang), being a Huai-chun man and being placed above them, found that his actions were constantly being circumscribed.”7 This reflects the latent issues of the regional army system as it created centers of power aside from the Emperor or the state. This in turn meant that there was a lack of loyalty, discipline, and efficiency in the fleet, all flaws that were exposed in the Battle off the Yalu River. The ordnance supply officer for the Beiyang Fleet was Li Hongzhang’s son-in-law, Chang P’ei-lun, who Professor Wiliam Lockwood refered to as a “champion swindler.”16 He describes the cost of Chang’s corruption, whose ordnance department regularly filled shells with sand, and “When the shooting began, the Chinese fleet found that its total supply of ammunition amounted to fourteen shells per gun. Two 7,000-ton ironclads had only three shells in all for their 10-inch guns.”17 Benjamin Elman also notes that the Chinese were “hampered by woeful shortages of ammunition” at the Battle off the Yalu and that “Some were filled through the black market with cement rather than explosives.” Elman argues that this “suggests serious corruption problems in Li Hongzhang’s supply command.”18 Not only did this corruption limit the Chinese fleet’s ability to fire its guns during the battle, but having a limited number of shells also prevents effective live-fire gunnery training. In perhaps the most staggering display of outright corruption, at the commencement of hostilities between China and Japan, Elman tells of an observer who noted that Chinese ships had about half their crews, while the salaries for the crews were still being paid in full.23 These gross indiscretions helped doom the Beiyang fleet at the Battle off the Yalu River. Underequipped, undertrained, understaffed, and with the wrong men at the helm, the battle could only go one way. What is staggering is that for every institutional shortcoming suffered by the Chinese, the Japanese could point to an institutional success. While the Qing were unable to coordinate or consolidate their forces under a single command, the Japanese fleet was always unified, and trained extensively together as a single fighting force. This goes a long way to explaining the contrast in the conduct of the two fleets during the battle. While the Chinese opened fire from the extreme range of 6,000 meters, a Japanese account holds that the Japanese fleet held its fire until it had closed the distance to just 3,000 meters. Furthermore, the Japanese carefully coordinated their fire, “All the big guns on the Japanese vessels were directed towards the upper decks of the Ting Yuen (Dingyuan) and the Chen Yuen (Zhenyuan), the rest of the Chinese ships being fired at with guns of smaller caliber.”24 This tactical decision showed remarkable forethought on the part of Japanese commanders who knew their lighter weaponry could not hope to penetrate the armor belt of the two Chinese battleships. Although it is likely these sources were carefully checked by the Japanese government (who provided the authors with sources and documents), this tactic is borne out as fact by the reports which indicate that Admiral Ting was injured in the early stages in the battle, as Japanese fire crashed into the bridge of his ship and took out the signals mast, leaving him unable to communicate with the rest of the fleet. The Japanese remained steadfastly disciplined throughout the battle while chaos reigned in the Chinese formations. This is due to the fact that while the Chinese had neither the funds nor the supplies for extensive training the Japanese prepared for war by “incessant training at sea. Special importance was devoted to gunnery, torpedo work, and steaming efficiency.”25 Another major failing of the Chinese fleet was the reluctance to create a true naval academy and professional officer corps. The Japanese did not hesitate to do so, forming a naval school in 1866. The Japanese naval academy had existed for nearly thirty years by the time the Sino-Japanese War began. Using graduates from the school Japan had built a professional officer corps, and could count on well-trained commanders throughout the fleet. Many naval scholars suggest the Chinese focused too heavily on building ships while neglecting the training of their sailors. “The material growth continued at a rate more impressive than that of the Japanese Navy, obscuring the fact that the Chinese were doing little right other than acquiring more warships.”27 In Power at Sea, Lisle Rose attacks the Chinese mindset more directly, “China had chosen to concentrate on material power, Japan on the intelligence of its men behind the guns and in the engine rooms.”28 Perhaps the Chinese determination to adopt Western technology but maintain a Chinese essence blinded their mindset in this instance. The Japanese had no such pretensions, and strove to learn as much as possible about French Jeune Ecole tactics. Designed to help smaller fleets confronting a numerically and technologically superior enemy, these tactics were perfect for the young Japanese Navy. The Battle off the Yalu should be viewed as a textbook example of the Jeune Ecole in use against a quantitatively superior fleet. The picture which emerges after an examination of the two fleets on the day of the Battle off the Yalu River yields up a stark contrast. The Chinese had more ships, thicker armor, and bigger guns, but were led by corrupt and incompetent officers, faced a dire shortage of ammunition, and had no overall strategy or tactics. Against them was a far smaller Japanese navy, designed and built around a cutting edge strategy taught to them by French officers, with a professional officer corps and years of extensive training at sea under their belts. During the period from 1850-1941 practically every naval officer and expert was writing about the “decisive battle” that would invariably occur on the high seas in the next great war, where one fleet’s massive battleships would meet the others, and the two would go toe to toe just as Nelson and Villeneuve had at Trafalgar. This “decisive battle” seldom occurred however, with opportunities missed at Jutland, Heligoland Bight, Doggers Bank, Leyte Gulf, and more. But this decisive meeting of capital ships did occur at the Battle of the Yalu River and the Battle of Tsushima. 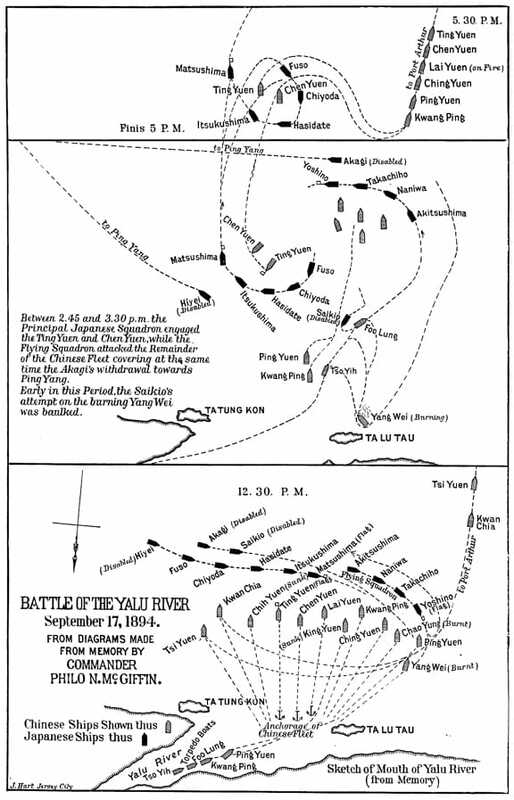 This makes the Battle of the Yalu River one of the most fascinating moments in naval history. The question of why the Qing failed despite their extensive modernization efforts and why Japan was so much more successful has occupied the minds of many historians throughout the years. Perhaps we have an answer in the form of Chinese failure to consolidate their regional fleets, rampant corruption, poor training, and inadequate personnel. These deficiencies were all exposed by a superior Japanese Navy off the Yalu River in the final, decisive battle of the Sino-Japanese War. The author would like to thank Dr. Lane Harris of the Furman University History Department for his assistance on the research and writing of this paper. 1. Elman, Benjamin A. “Naval Warfare and the Refraction of China’s Self-Strengthening Reforms into Scientific and Technological Failure, 1865-1895.” Modern Asian Studies, vol. 38, no. 2, May 2004, pp. 283-326. JSTOR. Accessed 3 Dec. 2017. 4. Herbert, Hilary A. “The Fight off the Yalu River.” The North American Review, vol. 159, no. 456, Nov. 1894, pp. 513-28. JSTOR. Accessed 3 Dec. 2017. 5. Elman, Benjamin A. “Naval Warfare and the Refraction of China’s Self-Strengthening Reforms into Scientific and Technological Failure, 1865-1895.” Modern Asian Studies, vol. 38, no. 2, May 2004, pp. 283-326. JSTOR. Accessed 3 Dec. 2017. 7. Spector, Stanley. Li Hung-Chang and the Huai Army. Washington UP, 1964. 8. Elman, Benjamin A. “Naval Warfare and the Refraction of China’s Self-Strengthening Reforms into Scientific and Technological Failure, 1865-1895.” Modern Asian Studies, vol. 38, no. 2, May 2004, pp. 283-326. JSTOR. Accessed 3 Dec. 2017. 10. Spector, Stanley. Li Hung-Chang and the Huai Army. Washington UP, 1964. 12. “THE SOUTHERN CRUISE OP THE PEIYANG SQUADRON.” The North – China Herald and Supreme Court & Consular Gazette (1870-1941) [Shanghai], 6 June 1890. ProQuest Historical Newspapers. Accessed 3 Dec. 2017. 13.“THE PEIYANG SQUADRON.” The North – China Herald and Supreme Court & Consular Gazette (1870-1941) [Shanghai], 29 June 1894. ProQuest Historical Newspapers. Accessed 3 Dec. 2017. 14. Lockwood, William W. “Japan’s Response to the West: The Contrast with China.” World Politics, vol. 9, no. 1, Oct. 1956, pp. 37-54. JSTOR. Accessed 3 Dec. 2017. 18. Elman, Benjamin A. “Naval Warfare and the Refraction of China’s Self-Strengthening Reforms into Scientific and Technological Failure, 1865-1895.” Modern Asian Studies, vol. 38, no. 2, May 2004, pp. 283-326. JSTOR. Accessed 3 Dec. 2017. 19. “Summary of News: LATEST INTELLIGENCE HANDS OFF! RUSSIA IS FIRM LOCAL NEWS FROM HOME THE BATTLE OF PINGYANG THE NAVAL FIGHT AT THE YALOO THE MOOR APOLOGISES LOCAL NEWS FROM HOME TO REASSURE JAPAN BAD NEWS FROM ST. PETERSBURG THE MILITARY CONTRIBUTION OF THE STRAITS SETTLEMENTS THE JAPANESE AT HAIYUENTAO THREATENING NEWS THE NAVAL FIGHT OFF THE YALOO GREAT FIRE AT MANILA THE NAVAL FIGHT AT THE YALOO THE SAFETY OF THE TRANSPORTS THE NAVAL FIGHT AT THE YALOO.” The North – China Herald and Supreme Court & Consular Gazette (1870-1941) [Shanghai], 28 Sept. 1894. ProQuest Historical Newspapers. Accessed 3 Dec. 2017. 20. Elman, Benjamin A. “Naval Warfare and the Refraction of China’s Self-Strengthening Reforms into Scientific and Technological Failure, 1865-1895.” Modern Asian Studies, vol. 38, no. 2, May 2004, pp. 283-326. JSTOR. Accessed 3 Dec. 2017. 24. Eastlake, Frederick Warrington, and Yamada Yoshi-Aki. Heroic Japan: A History of the War between China and Japan. London, Sampson, Low, Marston, & Company, 1897. 25. Rose, Lisle A. The Age of Navalism, 1890-1918. Missouri UP, 2007. 3 vols. 26. Elman, Benjamin A. “Naval Warfare and the Refraction of China’s Self-Strengthening Reforms into Scientific and Technological Failure, 1865-1895.” Modern Asian Studies, vol. 38, no. 2, May 2004, pp. 283-326. JSTOR. Accessed 3 Dec. 2017. 27. Sondhaus, Lawrence. Naval Warfare, 1815-1914. E-book, New York, Routledge, 2000. Warfare and History. 28. Rose, Lisle A. The Age of Navalism, 1890-1918. Missouri UP, 2007. 3 vols.